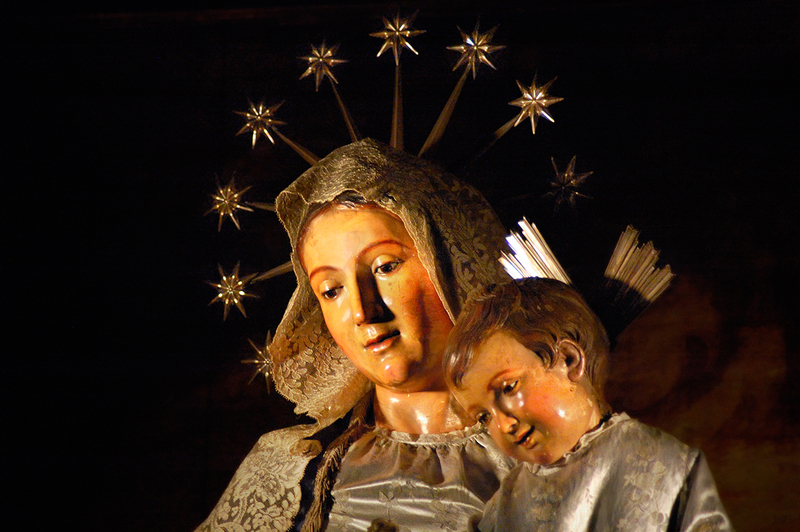 La Mare de Déu de la Mercè (Our Lady of Mercy) like many other churches holds beautiful works of art like this Virgin and Child. La Mercè is the patroness of Barcelona since 1637. According to the legend this patron saint helped the city get rid of a plague of locusts so the council in return named her patroness. But she was not canonized till 1888 during the famous Universal Exhibition in Barcelona. Please check this other post where you can admire the sculpture on top of the church: Our Lady of Mercy. I remember being in Barcelona a couple of times for the feast of La Merce in September. It's a fantastic time, well worth timing a visit then. That is a gorgeous sculpture, although I find it so interesting that Mary has such a prominent place in RC practice in certain areas of the world. Everyone needs a mother, I guess. It is a lovely statue. There is one with similar coloring in a monastery four miles from my town. I've often wondered about the paint used. Have a great week, Carlos! -You are right Winifred. September has some beautiful celebrations, specially La Merce. lacquer or varnish, at least on top.